These partners created the vision of this project, put the pieces together and funded it. 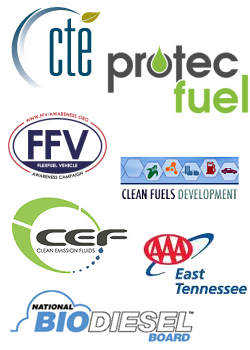 East Tennessee Clean Fuels Coalition - ETCleanFuels wrote the project proposal and partnered with the University of Tennessee at Knoxville for successfully submitting and winning the grant. Director Jonathan Overly is the project manager. The U.S. Department of Energy, Clean Cities Program - The program that funded the project. Thank you DOE! The University of Tennessee, Knoxville (UTK) - UTK partnered with ETCleanFuels to submit the project to DOE, and is the grant recipient. Protec Fuel Management - Protec is a multi-station project partner in placing stations along the corridor, including primarily in Tennessee, Georgia and Florida. Center for Transportation and the Environment - Center for Transportation and the Environment, or CTE, is our Corridor Leader for the greater Atlanta area. They are helping us place 1 E85 location (already open, see map) and 2 B20 locations. Clean Emission Fluids - Clean Emission Fluids is assisting the project with refueling equipment and locations in Michigan (and perhaps other sites as well). FFV Club of America - The FFV Club of America is a unique effort that fills an otherwise void in the American E85 world: helping the FFV owner promote their proactiveness by working on the E85-user side. National Biodiesel Board - The NBB is our primary biodiesel partner and is helping us promote the collaboration and the effort. Over half the pumps being installed are or are going to be B20 pumps, and B20 pumps are slated to be added in every state Michigan to Florida! Biodiesel is an important fuel in our move to diversify our American's fuels' supply, and is an easy switch for anyone driving a diesel vehicle. Clean Fuels Development Coalition - The CFDC is assisting our project with awareness and effort promotion. The CFDC Website hits the nail on the head in their "about" statement on their Website: "CFDC and its members are always finding new and innovative ways to expand the market for cleaner-burning domestic fuels. We achieve our goals by educating the media, industry and government leaders, and the public about the dangers of dependence on oil and the benefits of developing renewable fuels like ethanol." AAA of East Tennessee - AAA of East Tennessee (AAAET) is assisting the project in biofuel awareness and in promotion. AAAET is taking the lead in talking to other corridor AAA agencies so they can assist in the effort's promotion, too. Hartland Fuels, LLC - Hartland (formerly Bosselman BioFuel Solutions) came along in late 2010 as a fuel supply and station-locating partner and is assisting us in setting up several locations including Gainesville and Miami, FL. Michigan State Energy Office - Tim Shireman of the Michigan energy department has been quite helpful with this project. Not only has attended almost 90% of the project calls, he has worked to help the MI-CEC with finding stations for them for the project. Tennessee State Energy Office - Assisted us during the first half of the project considering locations for stations in Tennessee. East Tennessee Clean Fuels Coalition - ETCleanFuels wrote the project proposal and Director Jonathan Overly is the Project PI. Kristy Keel-Blackmon assists in managing the project helping with station communications, NEPAs and cost share upkeep. Both helped develop the station partners for Tennessee including Speedway that helped us place 3 E85 stations in Tennessee in an area that was largely without E85 before! Michigan Clean Energy Coalition (CEC) - CEC is our Corridor Leader for Michigan and helped place one station for each fuel. They did a lot of work and we worked together frequently in talking with station owners and opportunities. Clean Fuels Ohio (CFO) - CFO is our Corridor Leader in Ohio and helped us place several stations along I-75 in the state, and has been an excellent social media partner! Kentucky Clean Fuels Coalition - The Kentucky Clean Fuels Coalition is our Corridor Leader for all of Kentucky and assisted with placing 2 stations, one of which was a dual fuel station offering both E85 and B20! Clean Cities-Georgia - CC-G has assisted greater-Atlanta project liasion CTE with promoting the stations placed during the project, as well as the project itself. These two orgnaizations work hand-in-hand on many projects. Central Florida Clean Cities Coalition - Formerly known as the "Space Coast Clean Cities," they assisted in locating some stations that might be part of the project in the middle part of the state along I-75. Clean Cities Tampa Bay - This up-and-coming Clean Cities coalition is working toward designation in 2014 and has helped us in the project promoting it in the greater central Florida region! Middle Georgia Clean Cities - Middle Georgia Clean Cities was our Corridor Leader in southern Georgia and tried to help us find a station for B20 or E85 in that 250-mile expanse of I-75. This coalition is no longer operational. These local or regional fuel brands/stations have installed biofuels at more than one location through the project. Thorntons - Thorntons has helped us locate stations in several states include Kentucky and Ohio, and add biofuels in locations that didn't previously have then, like Lexington, KY! Mapco & its station brands - MAPCO has installed B20 or E85 under a number of its brands. Florida Turnpike Services - The Florida Turnpike just happens to be the longest detour along I-75... all 265 miles of it. Thanks to a partnership with the Turnpike's management, we were able to add 3 E85 stations all along the Turnpike. CARAF Oil worked with us through Hartland Renewable Fuels to install 2 E85 stations in the Miami area near the end of I-75 there. Southern Alliance for Clean Energy - SACE worked with us looking at a couple of sites and ended up building a B20 and B50/B100 refueling site for Atlanta that is just east of downtown! Their refueling station partner - Down to Earth Energy, LLC - was a real pleasure to work with. General Motors - As the largest world-wide manufacturer of flexible fuel vehicles (FFVs) and an OEM that certifies B20 in its 2011 and newer Duramax 6.6L turbo diesel engines, we are proud to have GM as a partner! GM is helping build awareness of the partnership and the effort. Learn about the partnership that created the project. See the stations on the longest biofuels corridor in U.S. history. Meet the many partners that helped along the way. Visit the Project Genesis Point - ETCleanFuels.org. Using E85 requires a flex-fuel vehicle, or FFV, and while many diesel vehicles can use B20 it is worthwhile to check OEM statements to verify compatibility. Website maintained by ETCleanFuels. Questions, comments & suggestions are welcome. Copyright © 2014 ETCleanFuels. All rights reserved.